Our stamping brayer distributes ink or glue for a smoother, cleaner and professional finished. 1.The brayer moves with easy and don't need to press hard for the roller to move. 2.Clean the roller off with soap and warm water. Wipe clean with a paper towel or washcloth. 3.There is a hole in the handle, which can be hung after cleaning. If you are not satisfied with any quality problem of our product, please kindly Email us before you leave the review, we will give you replacement. 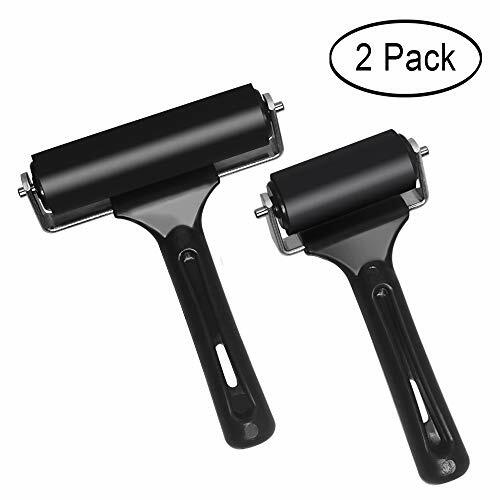 Widely-Used: Rubber brayer roller ideal for anti skid tape construction tools, printmaking, inking blocks , carved surfaces or stamping tools, scrapbooks, paintings, etc. Material: Rubber brayer is made of plastic grip handle, stainless steel frame and solid rubber roller . Features: Durable and comfortable handle, has a heavy duty steel frame that will not bend or break easily, the smooth surface of brayer contribute to all types of block printing. There are two finger prints that can help to adjust the power and direction. Easily Use : Glue roller moves with easy and no need to press hard for the roller to move, give you comfortable touch feel and pleasant user experience. Dimension: 3.8 and 2.2 inch two size available, very suitable for daily basic needs and feels great in your hand. If you have any questions about this product by Aipaide, contact us by completing and submitting the form below. If you are looking for a specif part number, please include it with your message.